The Second Edition of the TAS Touch Invitational Tournament will take place on Saturday the 17th of January 2015. This was such a great success in 2014, the organizers have come together to bring you what would hopefully be another fast-paced tournament!! Playing field: There is ONE full size field (70 m x 50 m) and ONE smaller size field (50 m x 45m). Tap ball on the smaller field will take place on the score line. TEAM ENTRY FORMS can be downloaded at http://goo.gl/lCvM6T, these MUST be submitted by 17:00, Thursday January 8th 2015. FB Events Page can be found here!! The 2014 Chinese Taipei Touch Tournament will be held on March 1st 2014, at Bailing Rugby Fields in Taipei, Taiwan ROC. 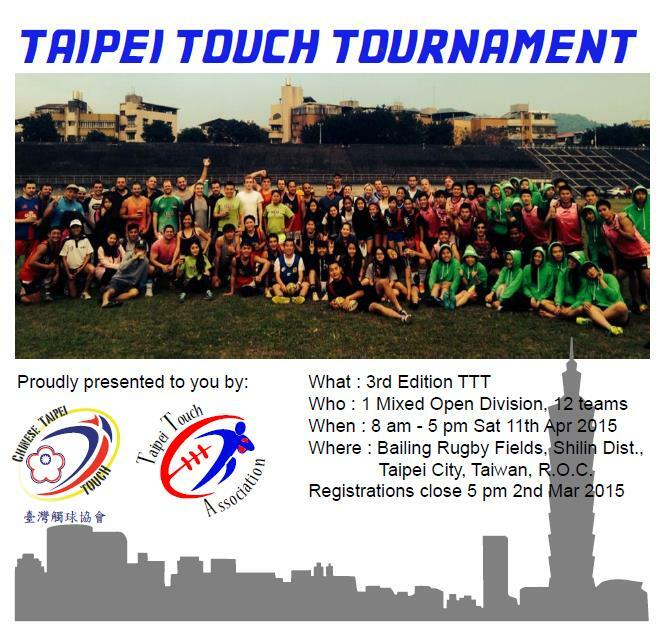 We are welcoming all teams, from Taiwan and Internationals to join us for what will be a fantastic day of Touch! Teams must use Team Sign-Up sheet and email them to taipeitouch@gmail.com and Team Captains must sign the Indemnity Waiver Form on the day before the tournament. Registration closes February 15th 2014. This year, well over 200 people participated in the 2013 Chinese Taipei Touch Tournament with 12 teams entering the Open Mixed Division and 4 teams in the Junior Mixed Division. In the Mixed Open Division, Pacific Island Dragons beat out Taichung Swingers (or was it Spinners) in semi-final 1 and Team HUKIT defending against a fierce challenge from Taipei Baboons. The final was played out between Pacific Island Dragons and Team HUKIT, with HUKIT drinking out of the victor’s trophy. 4 Mixed Junior Teams entered with the final played out between 台中毛毛蟲兒童橄欖球隊 Taichung Caterpillars Junior Rugby Club Green and Tian Mu Irish after they defeated Taichung Caterpillars Whites and Taipei Angry Birds. Tian Mu Irish were victorious at the end. Congratulations to Taichung Touch Rugby for organizing another successful tournament. Special thanks goes out to Jacob Curran, Dwayne Smith and everyone else involved for all their effort into making sure the day went smoothly. Congratulations to Taichung for bringing the Zhong-Bei Ball back to their city, and to Taipei Red (Team HUKIT) for winning the Cup. Below is a wrap up written by organizer Jake. The 2nd annual Taichung Touch Tournament will be taking place this Saturday at Fengjia University, Taichung. If you are in town, or can make it to Taichung, it would be great to see you at the ground supporting the teams from around Taiwan. CTTA President Ting Fan represented the Chinese Taipei Association at the annual Shanghai International Touch Tournament (SITT). Below is his report of the event, including some clarifications on FIT rules, and take-outs from the refereeing coaching that was also part of the tournament. I represented CTTA and attended the SITT over the weekend. Below is the write up. SITT was a very well organized with over 600 players, 47teams spread over 7 divisions, playing on 7 full size fields at the Shanghai RugbyFootball Club (SRFC). Teams came from Thailand, HongKong, Japan, Malaysia, Singapore and other parts of China. Shanghai Touch Association (STA) are full of very genuineand friendly people. The main objective of my trip was to attend the Referee Workshop andmeet other teams from around Asia. For this year the tournament had more than20 referees, spearheaded by AlexWong (AUS, L6), Miah Williams (NZL, World No. 1, L6) with many other veryexperienced referees (L3-L6) flying from Singapore, Thailand, Hong Kong, Australiaand New Zealand. Thefeedback I heard afterwards were the quality of the referees which had apositive effect on the tournament. Teams expressing interest to visit Taipei: Tokyo Open(winner of Men Open division Cup), Shanghai Dragons (runner-up Mixed divisionCup). In saying that, we should be aiming to send teams away tolet ourselves known to other teams and help drive the interest for all parties. 5. Proper touch field (70m x 50m), 5 m is about 7 m.
Two referees – one on the side line, watching the Link& Wing, the other in line with the defensive team. Not the two fullbacksystem we have been using. 6. For mixed teams, 14/team, only 4 players (min 1female) are required to start the game. Allow 2 minutes to get players on thefield, otherwise game is forfeit. 8. Winner of coin toss chooses direction & sub box.They also tap first in the drop-off. On the “Fifth” touch, call “Fifth” or “FirthTouch” not “Fifth and Last”. Because an event might occurwhere touch count resets and the team in possession continues. Fwd Pass – Ball leaves the hand with obvious handgesturing forward. If the momentum and wind carries the ball forward, it is notforward pass. PENALTY Mark – Where the offense occurred. Sliding to score – Must be on the score line &beyond, never before the score line. Acting half only has 1-2sec to pick up the ball before “No half, play on”. The defendingteam must step over the ball, acting half then plays on. The attacking turneddefending team must retreat 5 m.
Delaying roll ball. The player have 1-2 sec to performroll ball, otherwise PENALTY is awarded. Minimum force to effect touch – Defending &Attacking players can push players, provided that – the player is not thrownoff balance, knocked backwards. Tactic used to help defenders to get back onside. Offside – no need to tell players they’re onside, onlywhen they are OFFSIDE, “centre/link/wing/jersey number you’reshort/come to me/here is the five”. Offside at roll ball – Defending player interferingwith roll ball, the PENALTY awarded at 5 m forward of the initial roll ballmark (where the offside player should have been, 15m gain). Offside at tap ball – PENALTY awarded at 10 m in front(where the offside player should have been, 20m gain). Player in possession initiates touch on a defendingplayer who is making a genuine effort to get on side – Touch counts. 17. Go by what you see: Warning – PENALTY – VoluntarySubstitution – Forced Substitution – Dismissal. Referee has discretion for anyplayer who are not in the “Spirit of the game”. Dismissal a period oftime – Referee decide how long the player is off for, but the non-offendingteam should get at least two attacking sets and two sets of defending sets. 10. Phantom Touch at scoreline: Award touchdown,defending playing can be sent off for whole game. Calling “Yes”, and persisting whilstknowing they are at fault, see scale of escalation below. Ball deliberately knocked from hands – PENALTY.Accidentally knocked from hands, touch count resets. Touch within 5 m line. If the team in possession rollsthe ball beyond the 5 m line, the defending team must all continue movingforward to make touch. If the team in possession rolls the ball within the 5 mline, the defending team does not need to move forward. Referee has control over the field, players andcoaches/team managers. * 在第五“Touch”時，直接喊”Fifth、FirthTouch” 而不是“Firth & Last”, 因為有可能發生情況讓控球方另獲得再6次Touch. * Half 最多只有1-2秒時間撿球, 沒有Half的話，1-2秒之後裁判會喊“Nohalf, play on”。防守隊可以往前，跨過球之後變成控球隊，然後有Half上來撿球。原控球隊變防守隊必須退5m. * 如果在5m 線外rollball, 防守方必須從達陣線一直往前執行Touch– 不能停留在達陣線上– 否則犯規Penalty. Chinese Taipei Touch Association was honored to be invited by Kaohsiung Rugby Union to participate in the annual Kaohsiung City Sevens Tournament, held at the world class facilities, The National Stadium (formerly known as World Games Stadium). With a capacity of 55,000 people, The National Stadium is the largest stadium in Taiwan. This year, 46 teams entered in the 10 categories: Junior High Sevens, University Sevens, Club Sevens, OB Sevens, Elementary Flag, Junior High Flag x 2, Junior High Girls flag, Women Flag & Touch which was played over three days. On behalf of Chinese Taipei Touch Association, a huge “Thank You” must go out to Kaohsiung Rugby Union for inviting CTTA. Especially Chairman Ming-Shan Huang , 主委黃明山), Director-General Zhi-Jian Ding (總幹事丁志堅), numerous volunteers for their thankless task of organizing such an amazing tournament which was played at one of the best stadiums in Taiwan. Thank you to all the coaches, managers, referees (Grant Dexter, Andrew Donnelly, James Chang, Matt Small, Dwayne Smith, Kenny Yip, Ho Ting Fung Anthony, Paul Rose, Jacob Curran and anyone else we’ve missed out!) and Eric Li for brining over the Hong Kong Galaxy. We look forward to return to Kaohsiung in 2014! Photos Courtesy of Grant Dexter, Jane Chuang, Judy Fung, 高雄市橄欖球委員會 and many others! On a beautiful & sunny Sunday in Taichung, Taichung Touch Rugby lead by Jake Curran, Dwayne Smith & Co., pulled off Another Touching Moment. The intercity competition between 4 Taichung teams, 2 Kaohsiung teams and 1 Taipei team saw two Taichung teams go through to the final. However, we will never know which Taichung Team will hold the bragging rights as the match was not played due to lack of daylight. The final match was the prized Zhong Bei Ball. An elegant hand-crafted trophy that will keep Touch thriving in Taiwan as it is contested between the cities of Taichung & Taipei. After an intense battle which saw neither team giving an inch, Taipei came out victorious and can bring the Zhong Bei Ball back to Taipei until the next challenge. From Chinese Taipei Touch Association 臺灣觸球協會，a massive thank you must go out towards Jake Curran and the crew at TTR for the thankless task of organizing the Boot Camp after the initial postponement. Thank you to the players from Kaohsiung Mituo HS Team, Mituo OB Team, Taichung Caterpillars, Taichungler, Juggernauts, Beefeater and Taipei for making this day happen!